Nora Dalzell studied art in Leicestershire and Nottinghamshire and during the 1970’s studied ceramics at Rotherham College of Art. Through her mentor and friend Leslie Goodwin, MBE, RWA, RI, R.O.I Nora Dalzell studied over a number of years to further develop her painting. With this encouragement from Leslie Goodwin Nora has persued a special interest in surface texture and colour. Nora Dalzell is a Fellow of The Royal Society of Arts and Nottingham Society of artists. She has exhibited paintings at: The Royal West of England Academy; The Royal Academy, London; The Royal Institute of Painters in Watercolour; and The Royal Institute of Oil Painters. In addition to Red Rag Modern Art Galleryin the Cotswolds, Nora Dalzell has also exhibited extensively in the UK and USA. 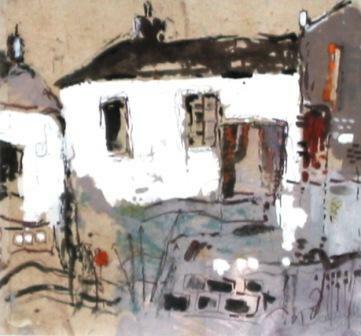 In December 2002 her paintings were exhibited at The City Gallery, Leicester and in Spring/Summer exhibited at Workshop Wales. Nora Dalzell's paintings are increasingly sought after and appear in many private collections.